Judge Norman Davis lashed the ministers for failing in their duties by granting a license and ignoring an impact asessment report, among others. The High Court in Pretoria has set aside the permission to permit Indian-owned mining company Atha-Africa Ventures to mine for coal in the protected Mabola environment outside Wakkerstroom in Mpumalanga. Judge Norman Davis yesterday delivered a damning judgment in which he severely criticised former Mineral Resources minister Mosebenzi Zwane and the late Environment minister Edna Molewa for not being transparent, and denying concerned parties a say when they granted permission for Atha to open a huge underground coal mine in the protected wetlands area. Davis set aside the decisions and referred Atha’s application back to the ministers for reconsideration on condition that they complied with the Promotion of Administrative Justice Act (PAJA) and took into account the interests of the local communities and the relevant environmental principles. Any decisions must be deferred until the conclusion of statutory appeals against the approval of Atha’s environment management programme and the issuing of a water licence, and until a management plan had been approved. If Mpumalanga’s Environment MEC Vusi Shongwe decided to exclude the mining area from the protected area before then, any party could approach the court for further relief. Davis also granted a punitive costs order against both Ministers and the MEC, saying there was no justification for their lack of transparency and departure from PAJA, which could possibly have prevented the litigation instituted by a coalition of civil society and environment organisations. He lashed the ministers for failing in their duties and seemingly following a “tick-box” approach by simply granting a license because Atha had the necessary approvals from other departments while ignoring a report about the impact of mining on the wetlands and relying on documents they never even saw, and without considering the impact of their decision on the environment. He said a higher level of scrutiny and transparency was required because former President Jacob Zuma’s nephew was an Atha BEE partner. “A failure to take South Africa’s international responsibilities relating to the environment into account and … that the use and exploitation of non-renewable natural resources must take place in a responsible and equitable manner would not satisfy the ‘higher level of scrunity’ necessary when considering whether mining activities should be permitted in a protected environment or not. “Such failures would constitute a failure by the state of its duties as trustees of vulnerable environments, particularly where it has been stated that most people would agree, when thinking of the tomorrows of unborn people that it is a present moral duty to avoid causing harm to the environment,” Davis said. Endangered Wildlife Trust CEO Yolan Friedman said South Africa had long recognised the grasslands of Mpumalanga, KwaZulu-Natal and Free State were “incredibly important” to South Africa’s natural heritage. “The grasslands are important water sources, and home to a range of production sectors that underpin economic development. 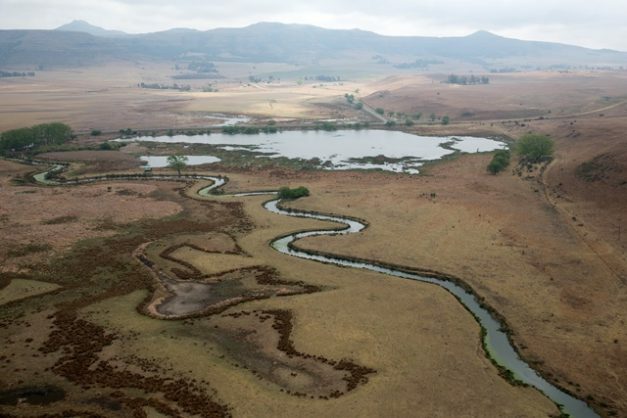 In the case of Mabola, the Protected Environment falls inside a strategic water source area which feeds some of South Africa’s biggest rivers,” said Friedmann. Mashile Phalane, spokesperson for the Mining and Environmental Justice Community Network of South Africa (MEJCON-SA) said the judgement was a victory for environmental justice. “We want to see protected areas actually protected against mining by our government as custodians of the environment on behalf of all South Africans. This custodianship is violated if decisions that have such important consequences are taken behind closed doors,” Phalane said. Catherine Horsfield, attorney and mining programme head at the Centre for Environmental Rights, welcomed the judgement. “It confirms to government and to all developers proposing heavily polluting projects in environmentally sensitive areas in South Africa that exceptional circumstances must be shown to exist to justify that proposed development,” Horsfield said. “South Africa is a water-stressed country, and the Mabola Protected Environment, where the coal mine would be located, has particular hydrological significance for the country as a whole. The environmental organisations submitted the worst environmental impact of coal mining would possibly manifest 45 years after mining stopped, when the mine voids were filled and the mines started to decant toxic acid mine drainage.